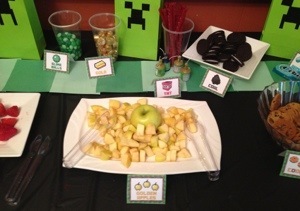 Minecraft Birthday – Teacher/Mom Style! I made the bags, below with black electrical tape. I just snipped squares and put them together. 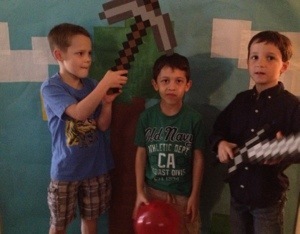 I made this photo booth back-drop with that big butcher paper on a roll. 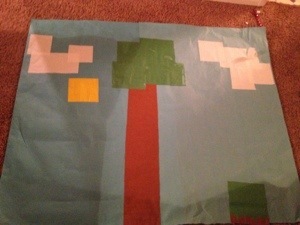 Then I cut out squares of the other colors to make the clouds, tree, sun and inverted grass block. I then taped it to the wall. 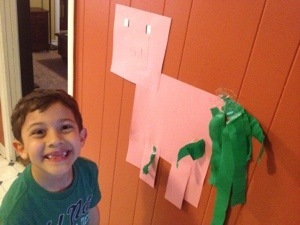 This little piggy was made with pink construction paper. 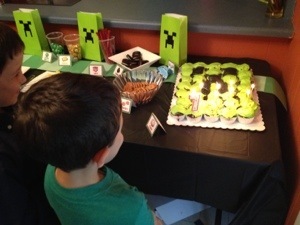 We used green streamer for the tail, for the game “pin the tail on the minecraft pig.” That was what I just happened to have lying around, nearby! Haha! A few weeks ago, my dad and husband trimmed the crepe myrtle trees and saved the branches. 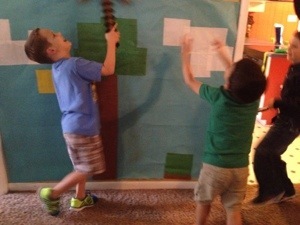 The kids found the piles and took it upon themselves to “craft” teepee’s. 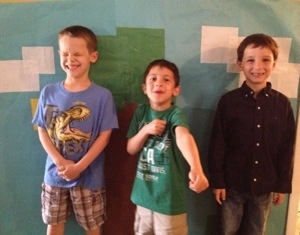 Our little ones are just so creative. 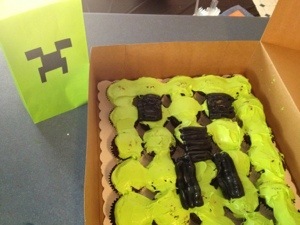 Look-its girls against boys! The branches actually held up with electrical tape. I just sat back and watch their creativity and team work! 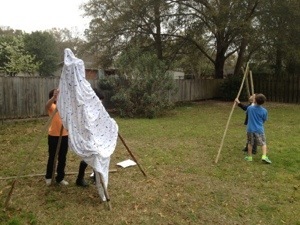 The kids ended up entertaining themselves with nerf gun games outside, outdoor chalk, bike riding, teepee building and stick gathering. 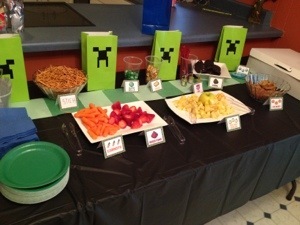 I am glad that I didn’t plan too many activities – they ended up being better party planners than me!